The Red Nose campaign–whitewash for tax cheats? Okay, I wrote this last year at this time. Please share it! 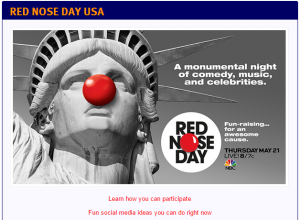 the Red Nose campaign is run by the biggest tax cheat in the corporate United States. on a computer or TV screen near you. already. Are any of you seeing lots of these ads? If you spend time online or waiting to buy groceries at Walgreens, or you watch a lot of NBC TV, you’re getting bombarded. Walgreens, NBC and Comic Relief are all onboard for this charity event, ostensibly to benefit poor children in the US (there’s also mention of Africa and Asia, but I’m guessing the United Way folks are emphasizing American kids.